Chickpea hummus with multigrain pita bread (sourdough bread recipe). 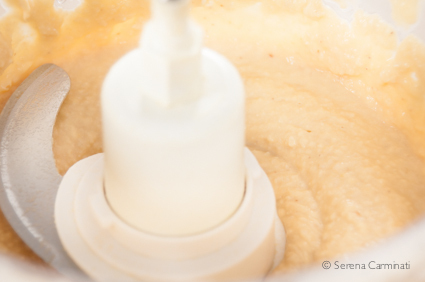 Hummus is a delicious chickpea spread, easy to make and suitable for every occasion. 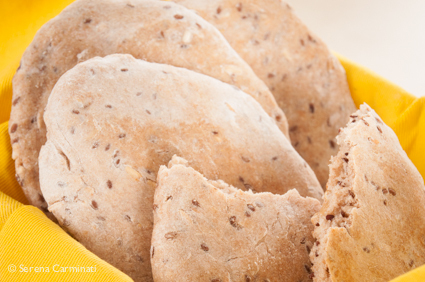 Served with this special multigrain bread it becomes a real treat! This dish is rich in vegetable protein, fiber and omega 3, found in flaxseed. It is a great balanced meal when served with salad or fresh vegetables, while served with bread it is a wonderful starter. 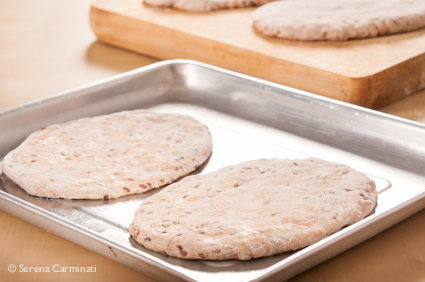 Method (Multi Grain Pita Bread). 1. 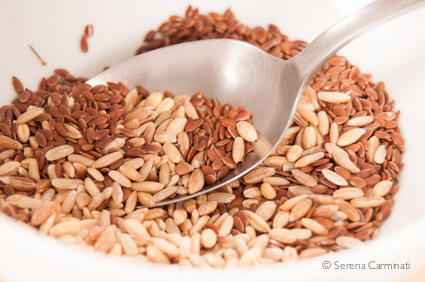 Wash the seeds in a bowl, changing the water several times, until it’s completely clear. 2. 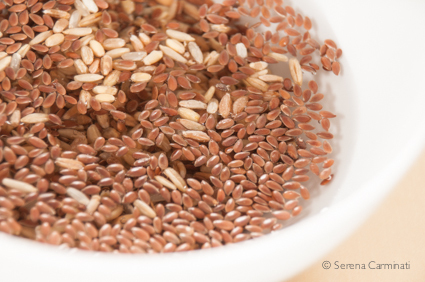 Leave the seeds to soak for 6-8 hours. 3. 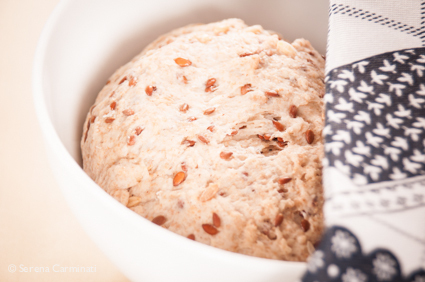 Mix the flour with the sourdough, adding some water and a little bit of malt (or honey). 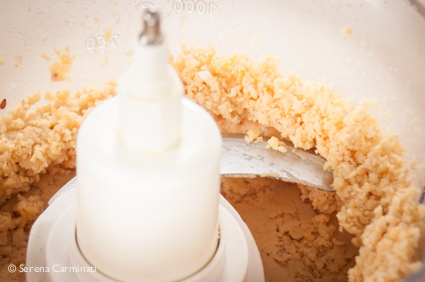 Sprinkle the seeds on top of the mixture, add a teaspoon of salt and knead everything well (adding flour or water if necessary, as the dough should be neither too sticky nor too hard and dry). 4. Let it rise for 3 to 6 hours. When the dough has doubled in volume, divide it into 4 pieces and shape them into flat breads, using a rolling pin, if necessary. 5. Lay your breads on a baking sheet lightly oiled and bake at 200 ° C (392° F) for 15 minutes. 1. 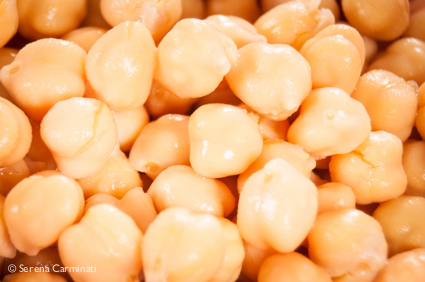 Wash and drain the chickpeas (you can boil them for a few minutes to be safe). 3. Continue to process adding the lemon juice, water, and gradually the olive oil, until you have a nice creamy sauce. 4. 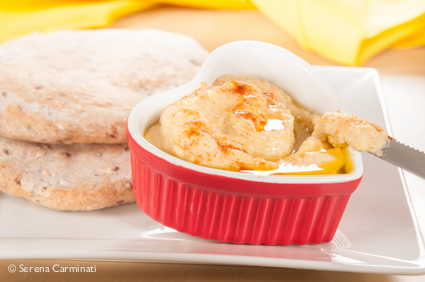 Put the hummus in a small bowl, top with some paprika and serve with the multigrain bread. Hummus di ceci con pane arabo ai cereali e semi di lino. Per 4 panini piatti (tipo pita) ai cereali. Preparazione (pane pita ai cereali). 1. Mettete a bagno in una ciotola tutti i semi, cambiando l’acqua più volte, finché non sarà completamente limpida. Lasciate i semi immersi in acqua per 6 ore.
2. Unite le farine al lievito madre, aggiungendo un po’ d’acqua e un po’ di malto (o di miele). Unite i semi all’impasto, aggiungete un cucchiaino di sale e impastate bene. 3. Aggiungete farina o acqua se necessario, l’impasto ottenuto non dovrebbe essere né troppo appiccicoso, né troppo duro e asciutto. 4. Fate lievitare dalle 3 alle 6 ore, fino a quando l’impasto sarà raddoppiato di volume. 5. Formate 4 pagnotte e stendetele su una teglia leggermente unta con olio d’oliva. Infornate a 200° C per 15 minuti. Preparazione ( hummus di ceci). 1. Lavate e scolate i ceci (potete anche bollirli per qualche minuto, per sicurezza). Frullate i legumi molto finemente con l’aglio, i semi di sesamo e il sale (per un risultato migliore, uso prima un mortaio per sbriciolare i semi di sesamo con qualche cristallo di sale grosso e poi li metto con il resto degli ingredienti nel tritatutto). 2. Continuate a frullare e aggiungete il succo di mezzo limone, l’acqua e in fine l’olio molto gradualmente, fino ad ottenere una crema. 3. Mettete l’hummus in una ciotola, aggiungete una spolverata di paprika e servite con il pane ancora cado. Hey! So glad to see you are back and posting again. 🙂 Homemade pita and hummus…what a fabulous post. It is so easy to go out and purchase these two lovely delights. However, if your make them I am sure you can not compare the quality of taste and freshness. Lovely. Hi!!!! For some reason I never actually think anyone is really following my blog! Well, thank you!!!!! 🙂 I am sorry it took me some time to post the new recipes, but I am back! 🙂 Love hummus, is one of my all time favourite! Very easy to make and so tasty, and I think it’s important to have good quality ingredients, this is why I make my own.